The American Council for Headache Education says that headaches and migraines affect about 30 million people in the United States every year. At Franklin Rehabilitation, our team may be able to help you treat your headaches and migraines with physical therapy. There are many different types of headaches and migraines that you may be suffering from. The Franklin Rehabilitation team can help you with these painful conditions. One type of headache that we may be able to treat with physical therapy is tension headaches. Tension headaches are typically the result of excessive tension in the muscles of your neck and back. There are many physical therapy techniques that we can use to help you release this tension. Another type of headache that our team can assist you with is a vascular migraine. A vascular migraine tends to result in more severe pain than a tension headache. Unfortunately, there is no definitive cause of vascular migraines. However, some medical professionals believe that this form of head pain comes from restrictions in blood flow in the neck and back. These types of restrictions are ones we can help you address with physical therapy. The third form of headache that the Franklin Rehabilitation team may be able to assist you with is a cluster headache. This is a rare form of headache, and it tends to occur in groups or clusters at random times. They’re also known for causing excruciating pain over a period of 30 to 90 minutes. The final type of headache that our team may be able to help you with is a traction and inflammation headache. This type of headache is usually the result of a severe sinus infection. This headache type may also be a symptom of more serious medical problems, such as a stroke. The team at Franklin Rehabilitation may be able to help you with these and other types of headaches and migraines. Our physical therapy treatments may also keep you off of addictive pain medications. The physical therapy methods we use at Franklin Rehabilitation allow us to build a therapy plan that may provide relief for your headaches and migraines. One of the most common techniques that we use for head pain is manual therapy. This technique involves a massaging and manipulating of your neck and back. These movements help to increase blood flow to these areas, and they may also reduce your pain. In addition to this technique, we may also include some therapeutic exercises into your therapy session for head pain. These exercises may help you in several ways. First, they help you develop better posture. They may also improve the flexibility in your back and neck. Second, therapeutic exercises may increase the strength of the muscles supporting your spine and neck. Finally, therapeutic exercises may help to reduce the muscle tension and blood flow restrictions that can cause head pain. A third physical therapy technique that may be added to your therapy program is electrotherapeutic modalities. These modalities include forms of therapy such as electrical stimulation and ultrasound therapy. Electrical stimulation helps you with low-power electrical pulses. In ultrasound therapy, our therapists use sound waves to help you. Both forms of therapy may stimulate the muscles in your neck and back. In turn, this stimulation reduces your likelihood of experiencing headaches and migraines. The team at Franklin Rehabilitation can build you a therapy plan that helps to relieve your chronic headaches. The success of our treatment plans relies on the benefits of our physical therapy techniques. A plan that uses one or more of these techniques may even reduce the number of headaches and migraines you have. At Franklin Rehabilitation, our physical therapists can help you begin your headache and migraine treatments. The way we’ll begin your treatment is with our three-step physical therapy process. The first step in this process will be for you to come to our office for an initial evaluation. In this evaluation, our physical therapy experts will examine you closely. 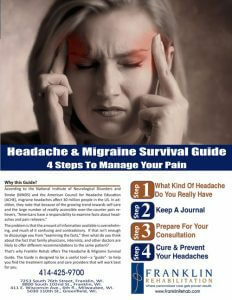 This will provide us with information about what is causing you to experience chronic headaches. The second step will be to build you a personalized physical therapy plan that may reduce the likelihood of head discomfort. The third step in the process is to educate you. One part of your education will be learning a home care treatment routine. This routine may help you prevent your headaches and migraines at the first sign that you’re experiencing one. To find out what kind of headaches you have, download our Headache and Migraine Survival guide here.